The aerosol optical characteristics in the East Asian cities of Fukuoka and Beijing were measured from 2010 to 2014. Previously, few long-term, season-crossing observations have been reported. 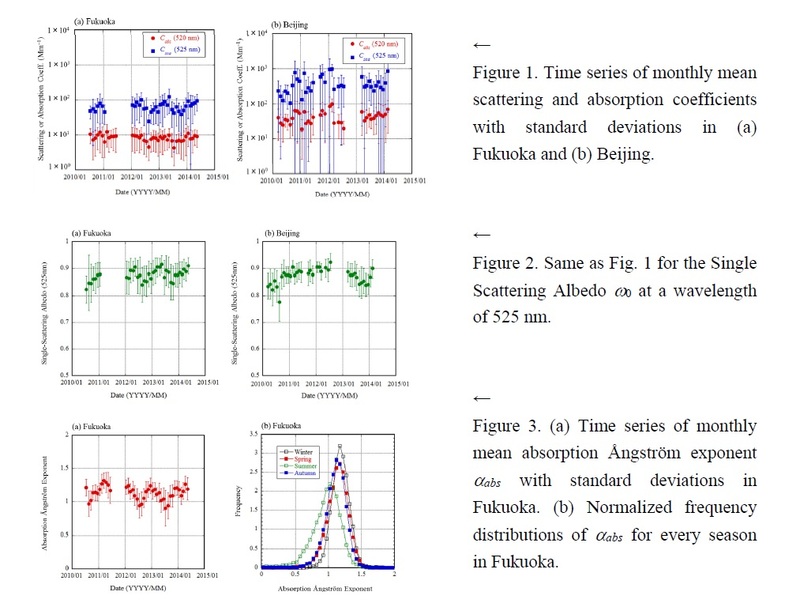 In Fukuoka, the annual means of the extinction, scattering, and absorption coefficients Cext (525 nm), Csca (525 nm), and Cabs (520 nm) were 74.6, 66.1, and 8.1 Mm−1, respectively, whereas those in Beijing were 412.1, 367.2, and 42.4 Mm−1, respectively (Fig. 1). The single-scattering albedos ω0 (525 nm) in the two cities were 0.877 and 0.868, respectively (Fig. 2). The asymmetry factors G (525 nm) in the two cities were 0.599 and 0.656, respectively. The extinction Ångström exponents αext in the two cities were 1.555 and 0.855, respectively. The absorption Ångström exponents αabs in the two cities were 1.106 and 0.977, respectively. Cext, Csca, and Cabs showed a seasonal variation in both cities. Some aerosol properties also showed a seasonal variation. In particular, the seasonal variation in αabs was clear in both cities; it tended to be small in summer and large in winter (Fig. 3).